Keeping your tires in order is an important part of your vehicle maintenance. Tire failure while on the road can be disastrous, so you should always take steps to minimize these risks. Your car insurance policy won't likely pay for routine wheel and tire maintenance. However, that shouldn't stop you from having your tires and wheels checked and maintained. If you have an accident, and your insurance company determines tire neglect to be the cause, they may deny your claim. Keep these five tips in mind to ensure that your tires are always in their best state. The tread on your tires helps them grip the road. As you drive, your tires' treads begin to wear out. As the tread becomes more worn, you might have a hard time stopping, and your risk of skidding rises. The life of your treads depends on factors like where and how much you drive. Old treads are less defined and appear worn or shiny. There is also a Penny Test you can use to determine the tread health. This test varies based on the source. However, all tests involve sticking a penny into the grooves of your tires. Worn tread means that you need to get new tires. Low air in your tires could be a sign of leaks or punctures. No one wants a flat tire, so you should keep an eye on your tire pressure. Low tire pressure also raises the risks of tires shredding, which can be catastrophic on the road. Most cars and tires have recommended tire pressures. Good tire pressure helps keep your systems running and fuel consumption optimal. Tires gradually lose pressure over time. Filling up the tires once every couple of months can reduce risks. You can buy tire pressure gauges in most department and hardware stores, often at low costs. These gauges can help you measure your tire pressure. Lug nuts that hold your wheels to your axles can come loose from time to time. This raises the risk of a tire coming off while you are driving. If you hear noises while driving, or feel vibrations, it may be the sign of a loose tire. You can often tighten nuts and bolts yourself. However, you can also have a mechanic tighten your nuts when you have the car serviced. The alignment of your axles and tires is important to keeping your car straight on the road. 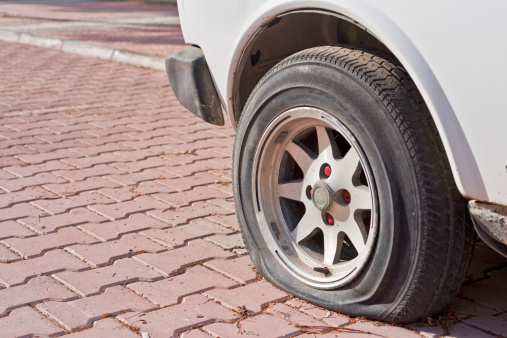 If a single tire is out of line, then your car is at risk of losing control. When you have your car inspected, a specialist will likely check the alignment. But, if you notice your car drifting, you might want to have the alignment checked. Driving through large potholes, hard braking and even ignoring speed bumps can damage your tires. You should do your best to slow down when you encounter these hazards; try and go around them if possible. By practicing safe driving, you can minimize risks to your tires. If you do have tire trouble, don't despair. Many car insurance policies offer roadside assistance in the event that you end up with a flat tire or need a tow while on the road. If you're considering getting a new policy, we can help. Call Cloverleaf Insurance at (800) 530-5822 for an instant car insurance quote. Since Im about to get new tires for my car, I want to make sure I know exactly how to keep them in good condition. Thats why I really like how you mention that most cars and tires have recommend tire pressures. I would imagine that if you follow the manufacturer instructions and recommendations, your tires will last a lot longer than if you just filled them up however hard you wanted.